As a result of developing the unbreathable air that hovers over the steel and class and neon coffinopolises of the Middle Kingdom, the Chinese have suffered something far more damaging: Unemployed westerners with nothing but a dream and a product that rolls the eyes and breeds headline type. From the same cocksure universe as “selling ice to the Eskimos” comes the late-capitalism concept of selling air to the Chinese. If there’s a greater metaphor for the toxicity of entrepreneurship, I don’t want to it inhale it. Because this is the darkest possible timeline, and things fall apart and I’m tired and cranky and need a hug from a partner I’ve shunned, bottling air and selling it to people seems absolutely fine. Each can of Vitality Air retails at $30 and garners you around 160 breaths, which equates at 20c a wheeze. Considering the average person breathes around 16 times a minute, it roughly equates to $2.30 a minute, $192 an hour, $4,608 a day and around $1,618,920 a calendar year. I mean, if you want to do it properly. Below is their advertisement. Not satire. All I need is the air that I breathe, and to be pppaaaiiiiidd. Disappointingly, we’re also to blame, as one Blue Mountains resident has got in on the market. John Dickinson was shocked by his trip to China, a man who recognised the ills of the world and did something about it. Upon wondering how people can live like this, he decided to altruistically help them out. He will give the export fine Australian air to the struggling Chinese, but you know, for a price. $72 for a twelve can bundle. Could be worse. Hailing from Somerset is a man who nicknamed himself as ‘the Louis Vitton of air’. 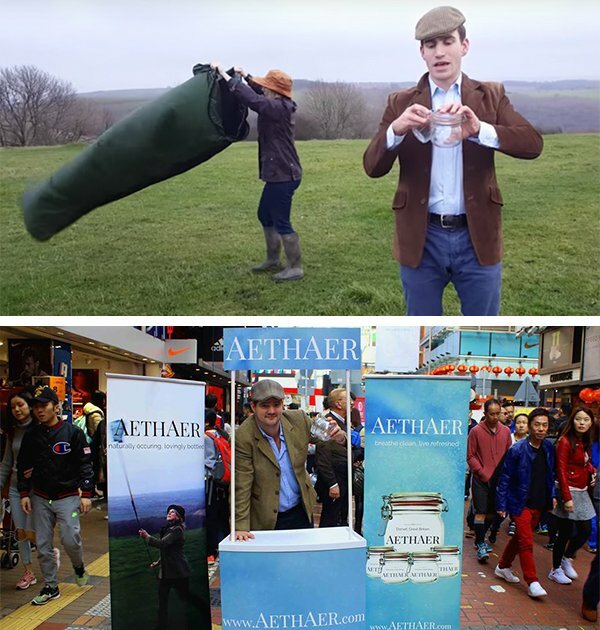 Leo De Watts, a self-proclaimed ‘air-farmer’ harvests the atmosphere of his hometown, before trundling off to China to flog his wares in a mason jar. Stop the capitalism, I want to get off.